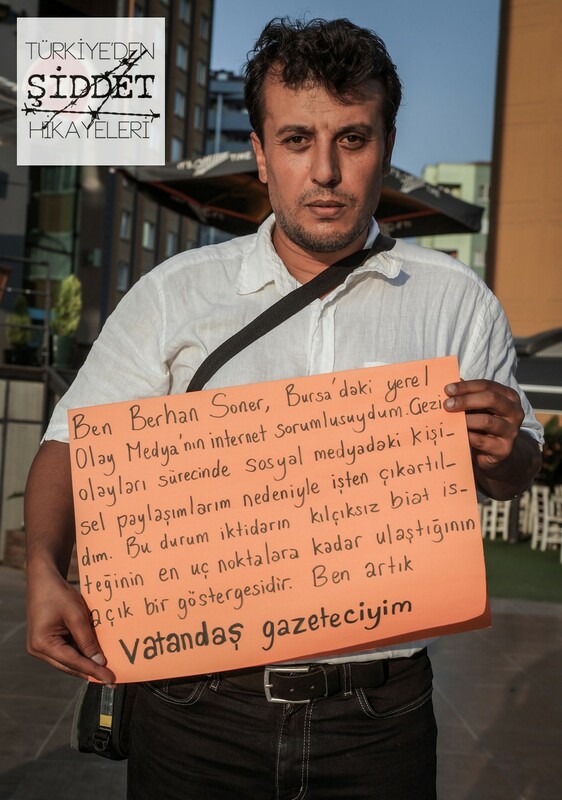 Berhan Soner, working for Olay Newspaper, which has been published in Bursa for 17 years now, and undertaking the editorial work for the online version of the newspaper, has been just another journalist who was condemned during the Gezi Park events. Soner drew government’s attention by what he wrote on Twitter, which is described as a “menace” by the PM Recep Tayyip Erdoğan. Whereas the amount of pressure and censorship that the mainstream press has come across is already percieved as “normal”, it has been rather shocking that the government’s pressure extends to the periphery, a journalist working at a local newspaper. Soner tells Stories of Violence from Turkey the thin red lines that became ordinary aspects of journalism, the pressure put on him for his tweets, and the power relationship between capital and the government that is present in local press. Was it the first-time- ever for you to be dismissed from your position due to your Twitter use? My position was actually terminated in 2008, after Savings Deposit Insurance Fund (SDIF) expropriated Olay Media for Cavit Çağlar’s debt to Interbank. We thought that the course of events that followed SDIF’s expropriation was a good opportunity for organised action under a trade-union, and we contacted Turkish Union of Journalists. We had no idea how to proceed with organisational matters related to a trade-union; nonetheless, we moved on anyway, and gained authority in Olay Newspaper and Olay TV to negotiate for a collective labour contract. How did the negotiations for the collective labour contract go? We were informed that SDIF officials were not content with the persons responsible for the trade-union’s involvement with the issue, and that the officials were trying to outdo the trade-union. As the presure built up, SDIF people were cornered, and they suggested to offer zero salary-increase to block the negotiations, and rather let it proceed as a court case. Meanwhile, something else that affected the course of events happened. The eid was approaching, and workers were going to be distributed complimentary chocolates. As I was chatting with a friend of mine from the workplace, I said “They offer zero salary-increase, and then distribute chocolate as if they are making fun of us. I am not taking any!” First my friend, then other co-workers of mine took up the same attitude as me. SDIF officials were informed about what happened. As a reaction, they started not to leave the complimentary chocolates on the desks of the workers, but instead distributed them with a sign-up sheet, where the workers who received their chocolate were supposed to sign their names in. Eventually, almost 30 people rejected the complimentary chocolates. After a couple of days, as we arrived at work, we learnt that we had been kicked out of our jobs . Although 5 workers, who said “I did not mean to join the protest; I was going to take the complimentary chocolates,” were given back their positions, a total of 8 people including myself were dismissed. How did you get back to your position in Olay Media? We won the court cases by which we plead for reinstatement. When these cases made it to the Supreme Court, Cavit Çağlar came to terms with SDIF, and the previous managers got back to their positions. As a result of the negotiations that we had with the managers, a friend of mine and I got reemployed. However, the other 6 friends of ours were not reemployed, despite all the promises made by the managers. I used to be the foreign news service editor, and I maintained the same position for a while. Following that, I was assigned to the Sunday Supplement, and then I took up the internet portal. Given your experience in internet journalism, how did the increase in social media use during Gezi Park events affect you? I was not an active Twitter user up to the Gezi Park events. However, I realised that there was considerable dissemination of information if the right twitter users are followed. While the most serious news channels failed to broadcast what was going on, we kept track of the updates via Twitter. I was retweeting what the people I follow tweeted in order to support the information flow. When did you receive the first warning concerning Twitter? The first warning was in the second week of Gezi events. The editor-in-chief came up to me and said, “Do not share abusive and insulting content on personal or institutional social media accounts. Some people are reporting them”. The reporting was done by one of the managers, assigned by the SDIF, and s/he had to flee when Cavit Çağlar was back. Just before they left, s/he and the other SDIF manager fired each other so that they could claim compensation. This person was reporting Olay’s headlines on Twitter to Bülent Arınç, and to Faruk Çelik, saying “Check out the headlines of a newspaper led by the SDIF itself!” Going a little too far, s/he started forwarding the tweets on personal accounts of the workers. I then told the editor-in-chief please not to get concerned, adding that “I never have a tendency to use abusive, insulting, violent and discriminatory expressions.” I also warned my co-workers. Was there a remarkable change in the tone of the warnings you received, after the reportings? I was called up to the office of editor-in-chief two weeks after the above-mentioned conversation we had. I found the managers of the TV and of the newspaper waiting for me. They warned me once again about my Twitter account. I got angry when I heard them say “Do not share stuff on your Twitter account anymore” and replied, “I have been fired before, so I know that getting fired is not a big deal. I have no fear regarding that.” As a matter of fact, I have been extra-cautious concerning my personal finances recently. I even pay my installments six months in advance so that I am always fail-safe. I was told that I misunderstood the whole thing, that they had no intention to fire me, but they had received a note. The note was basically a tweet of mine, asking “Why don’t you run inspections on local administrations that show off in the name of ‘delivering service’ and that are head over heels in debt?”. When I told them that they had no right to have a say on my personal accounts, the reply was “You are not merely Berhan Soner, you represent the institution”. Members of press prefer to have certain ethical statements on their Twitter accounts, such as “This content is my personal opinion, it has no bearing on the institution I work for.” Did you have any such statement on your account? I had my title “Olay Newspaper Online News Editor” on my Twitter account up to the Gezi Park events. After the second day of the events, I deleted it all, and remained a “citizen”. Nevertheless, it did not really work. The managers put it as, “You are pretty well-known in the journalism scene of Bursa. You are working here at the end of the day.” I told them that they could decide what I could or could not do during my shift and that I would not use Twitter during working hours, but they had no right to tell me what to do after 5 p.m. They did not accept this, either. How were you notified that you were fired? I was called up to the finance office some time towards the end of the month. One of the members of the administrative board said, “The boss is under a lot of pressure because of you. We cannot oppose it anymore. We need to keep you away for a while.” S/he first suggested that I take 45 days off, which was my official right to do, and then ask for a leave for 3-4 months, requiring no payment. The other option s/he put forward was for me to be content with my compensation, and my situation would be reconsidered after 6-7 months. It sounded as though I was being offered two alternatives; nevertheless, it was rather a farewell if you read between the lines. I said that I intend neither to target anyone, nor to knowingly cause inconvenience for my institution. And I added, “But I will not step back for others to feel at ease. That’s it.” My compensation was calculated, I bid them my farewells and left. What kind of publishing policy did the newspaper subscribe to during Gezi Park Resistance? Olay’s policy has been supportive of the government, since it was reinstated from SDIF. There are several reasons why this is so. Apart from the fact that Cavit Çağlar is still in debt, there are rumours that he is trying to maintain good relations with Bursa Municipality so that the land he offered SDIF in exchange for his debt could receive construction permit, as SDIF would accept the deal only then. All in all, I could still say that the publishing policy during Gezi Park events was balanced as far as the headlines, stories, and the reactions I received from people around me are concerned. Was the content you previously edited for publishing intervened with? There was no interference with the material published on the internet. Although my co-workers would feel uneasy about publishing certain stories, we ran everything. Why should we opt for auto-censorship? On the other hand, there is a black-list, and neither the people nor the topics included in that black-list could take place on the news. The items on the list change, depending on the personal affairs of the boss. Some people are praised at times, and on some occasions, they become invisible. I witnessed once that one of the black-listed had been cropped out of a photo via photoshop. The same story appeared on other newspapers with a picture, including him, while on our newspaper he vanished! Is he a vampire or what? Did you encounter any pressure that came down from the central administration itself? A warning that comes from the government is first told the local party leader by either a minister or a parliament member before it reaches the editor-in-chief, and finally we get to hear it. Hence we cannot track down the source exactly. If the editor-in-chief starts mumbling about the ways in which certain stories are written up, then it should occur to you that those stories do bother some people! As a result, you gather that you should be more careful next time about the people and/or the institution that those stories involved. Up to 2008, there was freedom of speech to a certain extent, however, there has been a considerable shift in publishing policy after the SDIF and Cavit Çağlar’s second period. What is your take on Cavit Çağlar’s position, concerning the pressure which he was under and the pressure he put on you? I believe that it is not the people or the institutions that should be in focus here but rather the implementations of the regulations that form these institutions. When we get carried away with anger at Aydın Doğan or Turgay Ciner, we tend to forget that they are tradesmen. They react when they get cornered financially, and they try to deal with the pressure. It is surely possible to get mad at someone, asking “Why wouldn’t you just resist the repression?” On the other hand, one should not miss the point, namely by whom the pressure is put. I opposed a campaign that was going to be organised for my reinstatement. What good would my reinstatement do? The editor-in-chief told me the following in our last conversation: “So, you think this ended well? You could have remained the internet editor for the biggest newspaper in Bursa, instead of tweeting.” I told him that I could not publish what I tweet on the newspaper. His reply was “Those days too will come.” We all work towards this ideal, but those days will not come if we do not take any action. The point is not my reinstatement; what matters is to stand up against the pressure. Has the amount of pressure on journalists in local press just been paid attention? There is actually nothing that makes my case special. It is pretty normal for the public to react when well-known figures who are a part of mainstream media are pressured. Fine, and who is Berhan Soner then? The reactions about my case were like “He was running a web-site in Bursa. How incredible that the wave reached out so far!”, and it attracted attention. The society has come to fear what the situation may come to, given that even a journalist from the periphery could be messed with. How did your co-workers get affected by what you have been through? Would you say that they might now be thinking to themselves “We should be more careful now.”? I most certainly think so, and that was the whole point anyway. They did the very same thing throughout the trade-union events; they first fired 8 people, some of whom were representatives of the institution, then they spread a rumour that only people who would not resign from the union were to be fired. Everybody resigned at once. Now, we are going through the same thing. The warnings lately point at an actual case: “We warn you. We warned Berhan, but he wouldn’t listen. See how he ended up!” So, this does not really have to do with Twitter only! This entry was posted in News, Personal stories and tagged Berhan Soner, Bursa, Gezi Resistance, Journalists in Gezi Resistance on 1 August 2013 .